Assessing an index fund's performance can be assisted by examining the particular index's historic record. 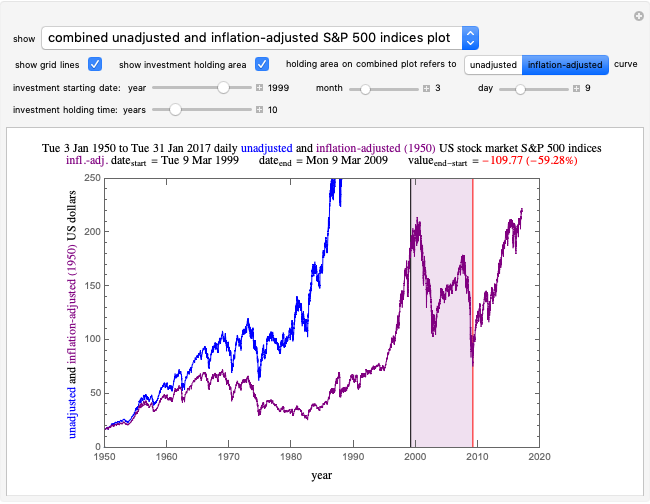 This Demonstration displays the S&P 500 index's record from 1950 to 2017 with and without adjustment for inflation, and calculates the gain or loss in its value (in absolute terms and in percent) after a chosen period's starting date and duration. For comparison, it also calculates and displays three measures of the index's performance during the administrations of the Republican and Democrat presidents from 1953 to 2017. Making a decision on how long to hold an investment in an index fund can be aided by inspecting the particular index's historic data record. 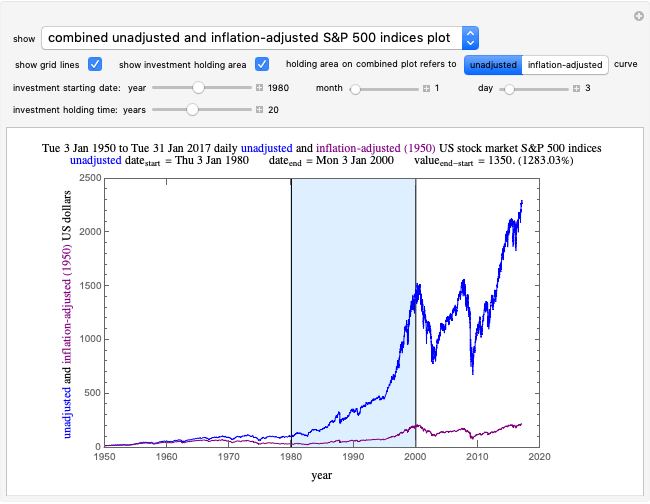 In this Demonstration, the S&P 500's index record may be presented in its raw unadjusted form, after adjustment for inflation to its starting date in 1950 or showing the two together, by selecting the desired display from the "show" popup menu. You can superimpose a delineated time period on the chosen type of record by checking the "show investment holding area" box. The time is shown as a shaded area, starting at a date set by the sliders "year", "month" and "day" and lasting for a number of years given by the fourth slider. Based on the index's unadjusted or inflation-adjusted value, the calculated gain or loss in US dollars between the selected ending and starting dates is displayed and also given in percent. If you enter a date on which the market was closed, the date is automatically reset to the last day the market was open before the entered date. 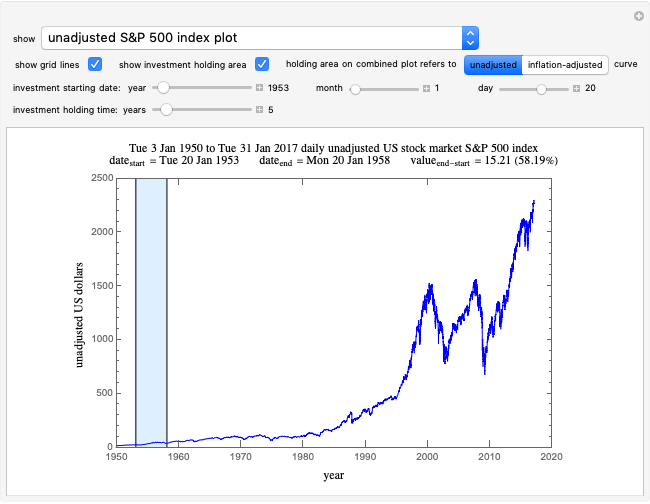 The choice of a starting and ending date may correspond to a particular personal financial history or to economic and political events that may have been factors in the index's rise and fall. The four sliders are active when one of the first three items in the "show" popup menu is chosen and the "show investment holding area" box is also checked. The setter "holding area on combined plot refers to" is only active if the third popup menu item is selected and the "show investment holding area" box is also checked. The setter designates which of the two displayed curves is tracked by the rectangular investment holding area. By moving the starting year's slider to the right or left, you can shift the shaded area forward or backward in time. In doing so, you may encounter a time period when the value of the fund at its ending date is less than it was at the start. A loss in value over that time is indicated by showing the rightmost vertical edge of the shaded area and the numeric displays of the loss value and percentage in red. See Snapshot 2. The shaded area shows specific starting and ending dates for holding an index fund. This can be used to illustrate scenarios such as an emergency that forced one to sell the entire fund at a particular time. Note that the actual yield of any mutual fund depends not only on the holding duration but also on factors that are not addressed in this Demonstration, most notably the expenses associated with maintenance of the fund. Although there need not be an obvious causal relationship between the sitting president's party affiliation and the index's performance, this Demonstration allows you to highlight it on the unadjusted and/or inflation-adjusted historic record from 1953 to 2017. This is done by choosing the fourth, fifth or sixth items from the popup menu. Two tables, one for unadjusted and the other for inflation-adjusted records, showing four measures of gains or losses in the index during the administrations of the 11 presidents who served full terms from 1953 to 2017 can be viewed by choosing one of the last two popup menu items. Notice that the entries in the first two columns of the two tables are the same as those displayed above the plot when the "show investment holding area" box is checked. However, you can choose any starting and ending dates during a particular president's term or presidents' terms that correspond to national or international events that may have affected the index's performance at that time. Mark D. Normand "Fate of a Long-Term Index Fund Investment According to the S&P 500"